Super Hero Boy: The complete twelfth season? Can you belive it. The complete twelfth season? Can you belive it. 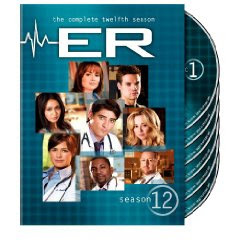 Actually ER has gone on much longer than 12 seasons but it just seems a little odd looking at the cover of ER The Complete Twelfth Season that its really been that long. I remember when ER first came out and how exciting the show was.. it was the first really great medical drama on TV in quite awhile and the first that really captivated me since watching MASH with my mom growing up. Personally I stopped watching ER on live TV somewhere around season five... not because I disliked the show by any means but just because I seem to only have the pacience to keep up with two or three shows maximum per season and ER had just moved down my list. Thats part of the reason I really love these box sets as they give me a chance to see shows that otherwise I may overlook as my busy schedule just doesn't allow me to spend much time watching TV past what seems to be the endless amount of children's television that seems to parade across our living room TV on a daily basis. The last ER season I watched in full via dvd was ER The Complete Tenth Season and that particular season was really eventful. ER The Complete Twelfth Season was much slower and much of the drama focuses on some newer characters that I just didn't have the history with so It took me awhile to get into the season. With 22 episodes to watch however you get to know them pretty well by the end. However my favorite two characters share center stage for many of the episodes which by far make this entire season worth wild. Abby and Kovac's relationship has always been one of my favorite story lines in ER and you'll be glad to know its an ongoing thing in this season. You also meet Dr Victor Clemente in this season as well. Overall though ER The Complete Twelfth Season may be a bit slower than the last season we reviewed its a great season and well worth the time regardless if you've seen it before or if your like me playing catchup on past seasons. You can pick up your own copy on Amazon right now!